Kirsten Dunst has a pretty amazing list of filmography to her name. The first movie I remember seeing her in was Interview with the Vampire (1994). A year later she appeared in Jumanji (1995) and probably most will remember her from the Spider-Man movies. Earlier in the week we met Johnny Depp’s Mini-Me and also Carmen Electra’s Mini-Me. If you’d like to see more of these “mini-me’s”, check out the official contest over at Worth1000.com. Good morning Have Laptop Will Travel readers. For those of you wondering, Carmen Electra and her “Mini-Me” appeared together at the red carpet movie premier for Johnny Depp’s Pirates of the Caribbean: Dead Man’s Chest movie premier. 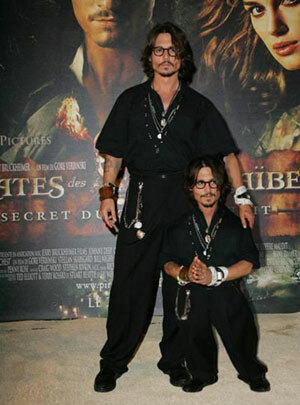 For those of you wondering, Johnny Depp and his “Mini-Me” appeared together at the Pirates of the Caribbean: Dead Man’s Chest movie premier. Back in 2006… it’s so funny to be saying that now since we’ve just barely come into the year 2007… the movie Cars by Pixar was released. It’s a cute animated film about a hot-shot race-car named Lightning McQueen that gets waylaid in Radiator Springs, where he finds the true meaning of friendship and family. 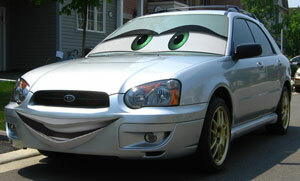 So if you’d like to learn how to do this, here is a link to the tutorial on making your car look like a Pixar Car. Enjoy! Disclaimer: The car pictured above is not my own car but I’ll be doing a picture of that soon.